Moulin Jaune is a kind of laboratory: a place saturated with creativity, eternally changing, each moment full with yearning for creativity. Here, no project is ever truly over and no experiment can be deemed a failure. 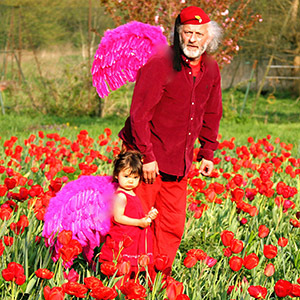 Slava Polunin, a clown, president of the International Academy of Fools and the official Ambassador of H.C.Andersen, and creator of Slava’s Snowshow. At the Moulin Jaune, Slava invites multi-disciplinary artists and artisans to create an adventure where nature, creativity and everyday life are weaved together into joyful festive and wonderful living. The house, the garden and every single day at this ancient watermill are filled with theatrical happenings and celebration of spectacle and imagination. 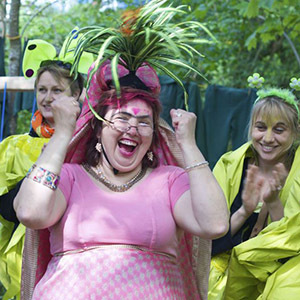 In the colourful gardens around the Mill one will find enchanting fairy tales, outsider art and felliniesque circus. Next events will be on June 15 and 16 (tickets will be sold from May 15) 2019 and more openings shall be announced a few weeks in advance. The garden of Moulin Jaune only opens to the public on some occasions for events, self-guided walks and workshops. To stay updated about our events, workshops and pricing, subscribe to our newsletter using the form below or follow us on facebook. It's a creative lab and a parc that consists of several gardens, each one is also a scene and a stage for artist interventions. In a home that is also a theatre every room has its own universe, span by Slava's travels and imagination. 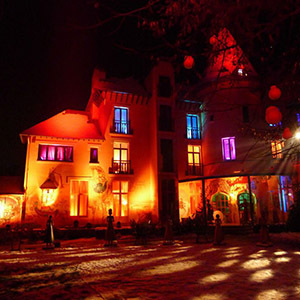 Slava creates at the Moulin, like a stage spectacle, the art of living that is joyful and and theatrical at the same time. Faites-nous un don! Chèque à l’ordre de «ASSOCIATION LE MOULIN JAUNE EN FÊTES» ou par Paypal.